Many broadcasters are considering multi-site operating or even using the cloud to make their content more widely available. In fact, the trend in broadcast operations is towards distributed operations and cloud will be used increasingly to support workflows over multiple locations in order to maximise efficiency and to alleviate bottlenecks. For example, whilst content preparation for playout might be focussed on a central site it is often the case that some tasks might be better executed in another location, perhaps for language reasons or teleworking. This is potentially beneficial but could lead to confusion with operators that are not used to this way of working. Put another way, its difficult enough for operators who are facing increased workloads as channels proliferate to keep track of content preparation on a single site let alone across remote facilities. For this to work successfully the use of a workflow manager is essential and specifically one that can distribute individual tasks to both local and remote users whilst at the same time giving system managers an up-to-date view of the performance of the production facility as a whole. When content is imported or ingested it moves from a tangible state to one where access can only be achieved with the use of a search engine; its actual location could be local in the system that created it or it could be in a remote location or even in a cloud. This virtualised state will very soon be the norm as operations increasingly move to file-based platforms. Rather than managing a few physical tape assets these systems are able to create multiple file copies adding to the complexity of organising the content and increasing the workload for operators. There are at least three scenarios for remote connections to a central site: a simple web connection for remote users using their workstation; connection to a remote system that has its own management system in the shape of a MAM; or directly accessing content that has been uplinked from the central system or resides in a cloud. It is the responsibility of the MAM or MAMs to track and manage content in the way that each enterprise requires, typically with either a single database or accessing other systems and discovering assets using federated search across the enterprise. 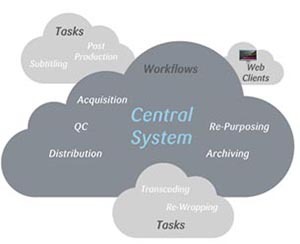 The term file-based workflow is often used to describe the result of building a platform where media items may be moved easily between different processes such as ingest to QC and then to archive. Whereas this may be loosely termed a workflow it doesnt guarantee any particular result. A file-based platform on its own is unlikely to deliver its maximum potential unless its supported by a workflow engine and manager. In order to deliver the benefits that a workflow can bring requires a strong management element otherwise tasks are effectively optional as to who started them, what happened during the process and what the final results were. The effective workflow manager needs to control and report on every aspect of typical broadcast operations in order that efficiency and accuracy are assured and so that reports on operations are available at any moment. This is rarely possible in a traditional media facility as it is difficult for operators to work efficiently and accurately without the tools to help them. Just as content may be seen as virtual or intangible the same could be said about operations. Many media enterprises operate across wide area networks where content and functions may be located far from the central facility or hub. Just as content need not be located in any particular area its preferable that media operations should be able to be worked on wherever the business dictates. Often the location for workflows will be based on parameters such as local expertise or load balancing the system as a whole. In order to make this feasible; individual tasks within workflows must be capable of execution in any connected location. It may be that in a complex workflow individual tasks may be performed under the control of the workflow manager, which aggregates all the data accumulated during each task in order to provide an audit trail and to give operators and managers a real-time view of processing across the entire enterprise. In this instance the workflow can be said to be virtual. However, as a business, the enterprise needs efficient use of recourses and real tangible profits. In this area the live and historic data captured by the workflow manager and MAM make possible the instant reporting on media processes both local and remote. In turn this data enables system managers to fine tune their workflows for maximum accuracy and efficiency. This type of monitoring of manufacturing processes is common in the wider world of business but is rarely encountered in broadcast organisations. In summary, this level of process management and control will be more and more essential if traditional broadcasters are to beat off the competition from new IT-based entrants to the world of broadcasting.